Solar Keymark Network (SKN) would like to apologize for changing the webinar date, which will instead take place on June 6 as indicated here. SKN, with this webinar, would like to update you about the possibilities to participate actively in his network. SKN is the assembly of the certification bodies, testing laboratories and representatives of industry active in the field of solar thermal technology. The main task of the SKN is the continuous improvement of the scheme rules and to resolve all kinds of technical and administrational issues (www.solarkeymark.org). All certification bodies and testing laboratories are required to become members, but the network only has a few regular industry representatives from Austria, Germany, Switzerland, Greece, Denmark, Spain and the Netherlands. Regrettably, manufacturers from other countries are not represented in the SKN. SKN invites you to seize this chance to actively participate in the SKN decision-making processes. This could be done either through your national solar thermal association (preferably) or directly through your company. Being a member of the SKN is free of charge, but regular participation and engagement are expected. For your information, two meetings take place every year – one face-to-face meeting in March and one virtual (web) meeting in October. We take this opportunity to remind you that experts, such as your company, participate in developing the EN and ISO standards which are used as a basis for the Solar Keymark certification, for the Ecodesign and Energy Labelling, and for many subsidy schemes or tax reduction schemes. To participate in shaping these standards, you may want to become a member of the national mirror committees of the standardisation organisation CEN/TC 312 and/or ISO/TC 180. If you need support on that, please ask our expert Vassiliki Drosou (drosou@cres.gr). 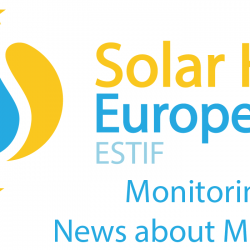 Should you have any question, please contact the Solar Keymark Secretariat at sk@solarheateurope.eu.